Sewer jetting with high pressure nozzles is the way to get rid of debris and hard to clean matter in a sewer. There are different types and sizes of sewer nozzles and it will depend on your sewer jetter and the size of the job as to which one you will choose. The ones specifically for this purpose will be customized according to the pressure and water flow. Our nozzles will range in pressure from a 1,000 PSI to a maximum of 10,000 PSI. The nozzles are custom drilled to match the water pressure and pump flow of the sewer jetter. Drilling: high pressure nozzles can also be used for drilling holes in soil and rock. This is called hydro drilling. There are a variety of different types for different purposes. They range from 1/8 inch to 3/4 inch. They are made from stainless steel and are rust resistant. Laser: this has one water jet pointing forward and 3 that are pointing back. This is an ideal attachment for sewers and drains with heavy grease debris. It is very effective for cutting through roots. Corner: this has 1 spray that goes sideways and 2 that go backwards. It is good for cleaning corners and sides of the pipes. It has a narrow jet for getting into tight corners. Ram: these high pressure nozzles have 2 sprays that point backwards. The are designed to ram through the dirt and grime. Rotating: they have 3 sprays backwards for cleaning debris and some nozzles have 2 sprays at the side for cleaning the walls. Excellent for rinsing purposes. Micro-drain jetter: they come in brass as well as stainless steel. These attachments are 1/4 inches and are MNPT. The brass ones have 3 reverse water jets. This is used to clean debris by using the rear water jets to create a forward thrust. The stainless steel ones have one forward water jet and 3 pointing backwards. These attachments will help to cut roots and for smaller pipes and openings. Warthog family of sewer high pressure nozzles: these are used for larger sewers and cutting roots up to 3/16 inch thick. They come in different sizes for different pumps. They can be used for pressures ranging from 2,000 to 8,000 PSI. It is important to match the right one to your pump. When you have to drill into the ground or clean up small and large sewers these attachments will help you. They are very durable and rust resistant. They last a long time but when they do finally wear down you will be able to replace or rebuild them as parts and replacements for high pressure nozzles are readily available. Discover the potential to diversify your pressure washer business with only a few accessory upgrades. 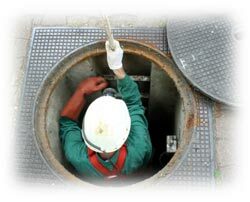 Find out on how to perform sewer drain jetting in residential or industrial pipes.